Sue Austin is an internationally acclaimed multimedia, performance and installation artist. In repurposing her wheelchair to create fantastical art, Sue reshapes how we think about disability. Sue Austin keeps a fascinating mission at the centre of her work: to challenge the idea of disabled as "other" and represent her experience as a wheelchair user in a brighter light. She does this by creating quirky, unexpected juxtapositions - bringing a sense of empowerment to the discussion of disability & difference. In 2012 Sue was awarded an Unlimited commission, to create a series of live art, installation, film, media and web events as part of the 2012 Cultural Olympiad. Since then her artwork has been viewed globally by over 150 million people, helping to reshape preconceptions by creating positive images and narratives. 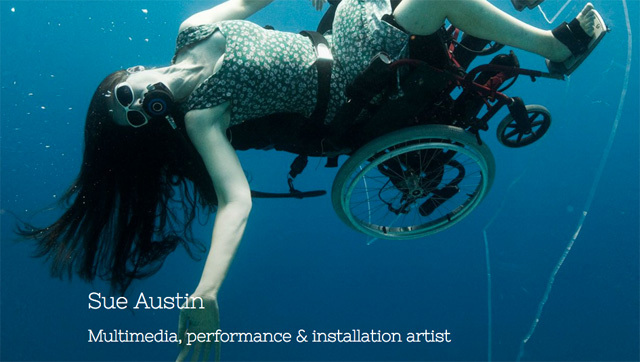 The first performances of the Underwater Wheelchair were held in Dorset, UK in 2012 with the first International Performance of the Underwater Wheelchair in Mainz, Germany as part of the Gesellschaft zur Förderung von Kunst und Kultur Festival in September 2014. Her films have been screened at Tate Modern in London & at other International Festivals in Qatar, Toronto and Portugal to name a few. Sue has been recently commissioned by 'The Space' to produce a series of films called 'Flying Free' documenting her quest to learn to fly, starting with 'Fledgling Flights'. In 2013 Sue gave talks to NASA in Houston, The Stanford University Spinal Cord Injury Unit Palo Alto, California & at the Monterey Bay Aquarium. Her MA exhibition was held at Plymouth University in July 2013. Sue was part of the group exhibition 'People Like You' at Salisbury Arts Centre and at Poole Lighthouse Gallery in 2013. Sue has given talks at TEDMED & TEDxWomen, has been interviewed on UK & International TV & featured extensively in the Global Media including BBC Breakfast News, The Guardian, ABC World News and The Times Newspaper. Sue has also recently been appointed as Artist in Residence at the University of Plymouth Marine Institute. Sue Austin is a multimedia, performance and installation artist. Over an extended period of time her practice has operated as a vehicle to open up a thinking space around the materiality of the wheelchair. This is being used as a metaphor to raise questions about the value of diversity to society through raising the profile of 'difference'. Rather than being didactic, however, a primary aim will be to create portals or multiple entrances into the resulting artwork (eg. through live art, associated online and multi-platform presentation, etc) so that it can find a way to ask questions but at the same time leave space for the audience to generate their own meanings. She aims to find dramatic and powerful ways to re-position disability and Disability Arts as the 'Hidden Secret'. She argues that this 'secret', if explored, valued and then shared, can act to heal the divisions created in the social psyche by cultural dichotomies that define the 'disabled' as 'other'. Through the performative presentation of a diverse embodiment, the main focus for this work is about reconfiguring preconceptions through the use of dramatic and unexpected juxtapositions that act to surprise, open up thinking and then, through that reordering of associations, to create empowered and empowering narratives. This manifests in an artistic practice that makes use of "surreal juxtapositions and quirky re-presentations of disability equipment to facilitate new ways of seeing, being and knowing".